Here is a card I made for the Eyelet Outlet blog today. Do you just love the lady bugs? So right now, I am in love with lady bugs. And SERIOUSLY - can these PINK ladybugs be any cuter?? Click right here to see them in the Eyelet Outlet store. 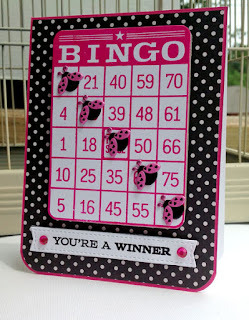 To make my card I used some black and white paper from Hobby Lobby and the Bingo stamp set from MFT Stamps. I also used their yummy Razzle Berry ink and card stock. Lining up the ladybugs to form a BINGO was so much fun! 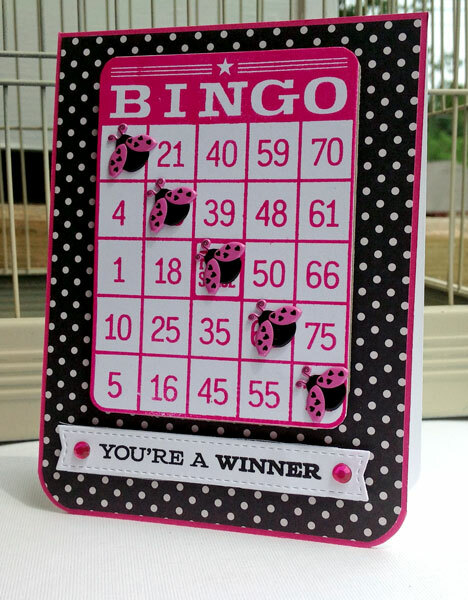 Try it on your next bingo card project! So that's it for right now. I'll be back in just a little bit with a second project for you today.